A 2017 Statista survey revealed that 49% of Americans favored animal tattoos. So it doesn’t come as a surprise then to find all sorts of animals inked onto different parts of the body. 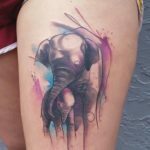 Among the animals chosen for body art is the elephant, be it for a nostalgic purpose (a love of Dumbo perhaps) or something more symbolic. 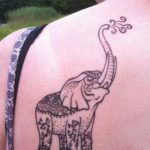 And one of the great things about elephant tattoos is that they can be depicted in miniature form or in large, intricate designs. But why would anyone want to put this animal permanently on the skin? Elephants have long been depicted in mythology, popular culture, and symbolism. The animal is revered in religion and admired for their capability in war. Putting an image of elephants onto surfaces has been a human practice dating back to the Stone Age, a time when our ancestors used caves to depict their environment. Today, elephants are seen in various forms of art, including body art. Asian elephants are revered as deities, symbolizing strength and wisdom. The African elephant is also seen in a similar manner: they are depicted in African fables as the wise chief who settles disputes among forest creatures. According to Hindu cosmology, mythical World Elephants support and guard the Earth. In Sanskrit literature, the shaking of elephants’ bodies when they are tired are the causes of earthquakes. One of the most popular gods in the Hindu pantheon, Ganesh, is represented in elephant form. Japanese Buddhism also adopts Ganesha, who represents the unity of opposites and is depicted by an elephant-headed male and female pair in embrace. Many deities in Hindi iconography are associated with a mount or vehicle, with elephants being one of them. The elephant vehicle represents wisdom, divine knowledge, and power; it is also associated with Lord Indra, who is said to have ridden a flying white elephant, who Indra made king of all elephants. Since white elephants are rare, they are afforded special significance. They are considered sacred and in Thailand and Burma, they symbolize royalty and are thought of as a symbol of good luck. Elephants are associated with Queen Maya of Sakya, Gautama Buddha’s mother, in Buddhist iconography. One of her dreams foretelling her pregnancy prominently featured a white elephant. As such, the white elephant was seen as a sign of royal majesty and authority. To this day in South Asia, elephants still figure significantly in religion. In temples, captive elephants are trained specifically for different temple activities. Elephants are also used in festivals in Sri Lanka. Elephants are also important in Thai culture, with the last year in the 12-year cycle of the Chinese zodiac being the Year of the Elephant rather than the Year of the Pig. The elephant is also significant in Islam, with the Prophet Muhammad being born in the Year of the Elephant. It was also the year when a Yemeni ruler attempted to conquer Mecca and destroy the Kaaba. However, his plan failed because his white elephant refused to cross the Mecca boundary. The elephant has been a popular subject for artists from the prehistoric days to the modern age. They are depicted in rock art in prehistoric North Africa, as well as other African sites. Many Indian rock reliefs feature a number of elephants, with the Descent of the Ganges at Mahabalipuram being one of the most notable. Elephants figure significantly in Indian painting as well. 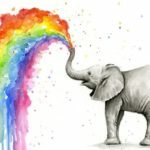 Modern artists such as Banksy, Andy Warhol, and Norman Rockwell have featured elephants in their work. 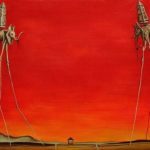 One of the most popular is the stork-legged elephant in Salvador Dali’s works. Asian elephants are intelligent and have good memory. In short, they can remember. As such, they are used as symbols of wisdom and power. Unsurprisingly, they have been used as emblems of different political parties. In the Indian state of Kerala, elephants play a huge part in daily life. As such, they are revered, loved, groomed, and given a prestigious place in culture. Elephants were once a curiosity in Europe, mostly known for their use in wars. They were soon used to symbolize imperial power: they were used as the emblem of the Seleucid Diadoch Empire and Napoleon Bonaparte wanted a bronze elephant fountain as a symbol of his power. In America, the elephant is the symbol for the Republican Party. The African elephant is also seen as a symbol of strength and power by many African cultures. Their tusks are used in the coat of arms of South Africa to represent eternity, moderation, strength, and wisdom. It’s not just regular folk that have been enamored by elephants. Even celebrities have chosen to put the animal in ink on their body. Two of the most famous celebrities who have elephant tattoos are Shawn Mendes and Cara Delavigne. Shawn Mendes, a Canadian singer and songwriter who gained prominence on the video-sharing application Vine, is no stranger to tattoos. He has a guitar made of trees, a lightbulb filled with flowers, a sparrow on his hand, and the number eight on his finger. Mendes said that he got an elephant stencil on his finger because it is his mother’s favorite animal. 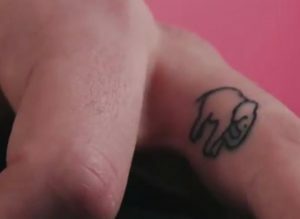 He had been convincing his mother to get a tattoo and since she was “obsessed with elephants” that’s the design they went for. While Mendes’ tattoo is small, Delavigne’s dainty depiction is on her arm and is much larger. She isn’t a stranger to animal tattoos as well: she has a lion on her pointer finger, a white dove, and a wasp. The great thing about elephant tattoos is that they can be done in any size. The body is a pretty large canvass and you’re free to choose where you want to put body art. 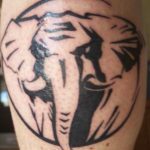 Many tattoos depicting elephants range from simple portraits to more intricate designs. Elephants are thought to bring good luck. And if you are to bring a statue of the animal into your home or building, it must face the door. An elephant’s trunk should also be pointing up for good fortune. 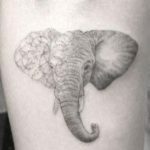 Given this line of thought, you’ll find many tattoos depicting elephants with their trunks up. Some, however, choose it for the aesthetics rather than its associated luck. Baby elephants are cute, and they are equally as adorable in tattoo form. They still don’t have their tusks and are often depicted in a charming manner. They can be depicted as shy, in multiples (the single file formation is common), and in color. Since babies are tiny, they too are often represented small form in body art. 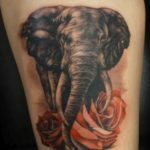 Elephants are huge and powerful creatures, and some tattoo designs portray that. It’s not uncommon to find an elephant standing on their hind legs with trunks up. An abstract depiction of elephants isn’t uncommon either. 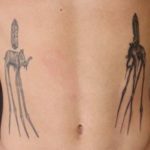 Salvador Dali made stork-legged elephants popular, and some choose to have that depiction on their bodies. Like Shawn Mendes’ stencil elephant, some also put brush-stroked elephants on their body. In short, there’s just so many ways to ink an elephant on your body. 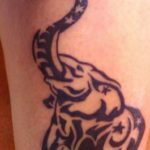 Some elephant tattoos also veer from the normal side-facing or front-facing elephants: they purposely choose an elephant design where the animal is facing backwards. It’s definitely unique and you won’t find likely find someone nearby with a matching tattoo. The Hindu-style elephant with all the intricate details is also a popular tattoo design. It’s also best appreciated when placed in areas that can depict them in all their glory like the thigh, the arms, or the back. 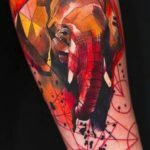 Single elephants are a pretty common representation in body art, but knowing how they are loyal creatures, it’s not surprising to see others choose to ink multiple elephants onto their body. Apart from the Hindu-style elephant, there are other more elaborate depictions of the creatures in tattoos. One example is that of elephants surrounded by intricate floral designs. Sometimes, the bodies of elephants are designed with a floral pattern. Geometric elephants are also common, as are full-color representation of elephants. The body is a canvass, with various areas suited for tattoos of a specific size. Even the fingers can benefit from tattoos, as evidenced by the stencil elephant chosen by Shawn Mendes. Also, baby elephants are usually chosen for small areas to work with, like the fingers, hands, or ankles. 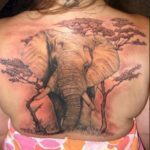 Some also choose to have an elephant tattoo in the shoulder region. With the area being big enough, it’s not unusual to see rather large depictions of elephants. A single-line formation of elephants is a good look, stretching from one side to the other. 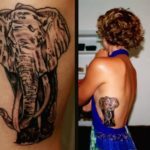 The arms are common places to find tattoos and their length is suited for somewhat grand designs, like elephant portraits for example. Like the arms, the legs are great spots for intricate elephant designs. A Hindu-style elephant looks amazing when inked on the thigh. An elephant in its entirety can also be depicted in the calf region. The knees can also be used for really interesting portrayal of elephants. Some even choose to do it in color. The back area is a pretty large canvass to work with where you can use the entire space or just a part of it. Some have chosen this area to put an elephant and its surroundings. As you can see, there is no shortage of places to put an elephant tattoo, with some even choosing the back of the ear. How about a nice elephant tattoo with some back dimple piercings? Surely someone could make that work.